I was hoping my first shot would be the Bald Eagles that often perch on the east end of Kiket. They weren't there, however, so this is the first shot with the new lens. 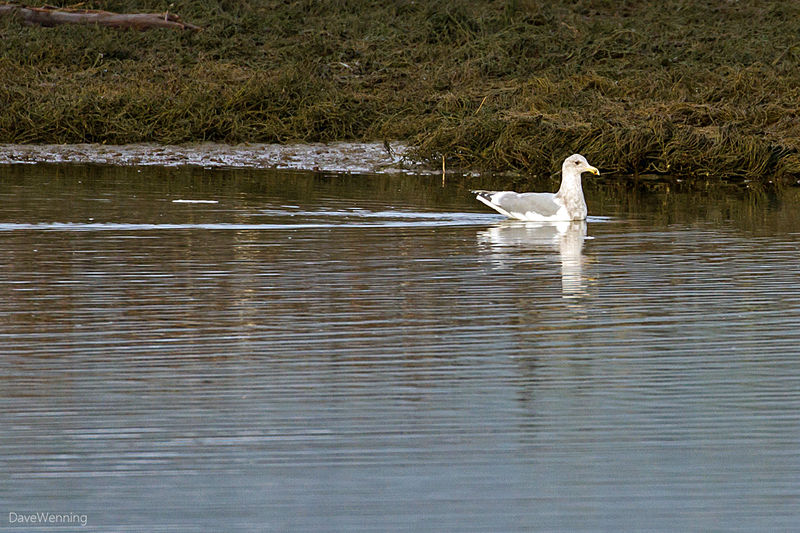 It is either a Glaucous-winged or Western/Glaucous-winged hybrid gull swimming in the pocket estuary. I am posting it only because it is the first, not necessarily the best photo to show off the lens. I thought it deserved to be commemorated. Remember, this lens is considerably better than the novice photographer wielding it. The first thing I noticed was the extra 18 ounces (510 gm) hanging around my neck. Compared to the 70-300 L lens I have been using, this one is noticeably heftier. Mounted on the 7D, which is a tank on its own, I was toting a total of 5.27 pounds (2.39 kg). I recommend a good ergonomic neck strap. The stock Canon instrument-of-torture strap is out of the question. I have been using one by Op/Tech USA which sits lower on the neck and it was reasonably comfortable. Have crane, will travel. 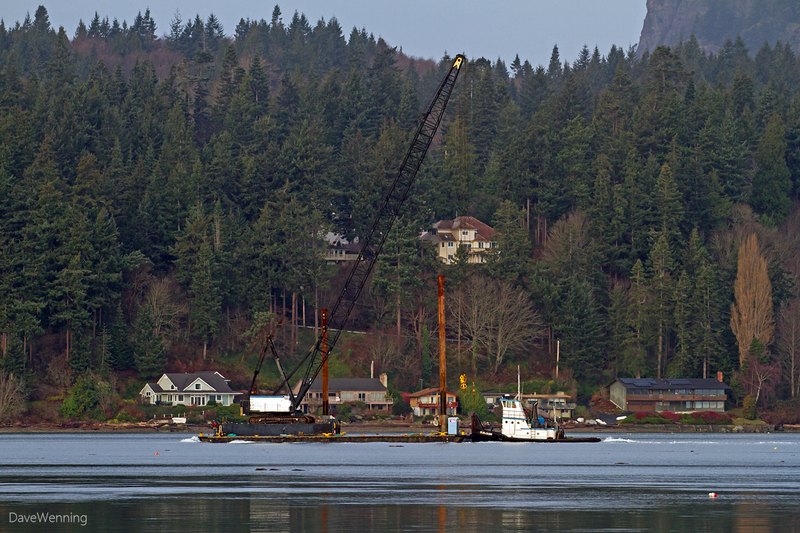 The next thing I spotted was this barge and the push boat Quilceda steaming out of Similk Bay. 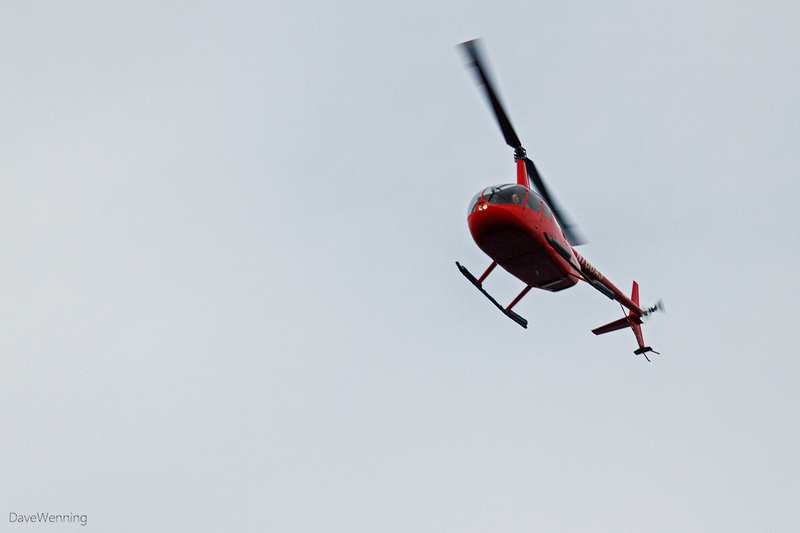 Continuing the transportation theme, this small helicopter buzzed over next. Finally, there was some wildlife which is what I bought the lens specifically to shoot. On the North Trail, I encountered this Douglas Squirrel. The lighting was very poor here, deep forest shade with some back lighting. These guys are usually hostile to intruders in their territory. A noisy scolding is what I expected. 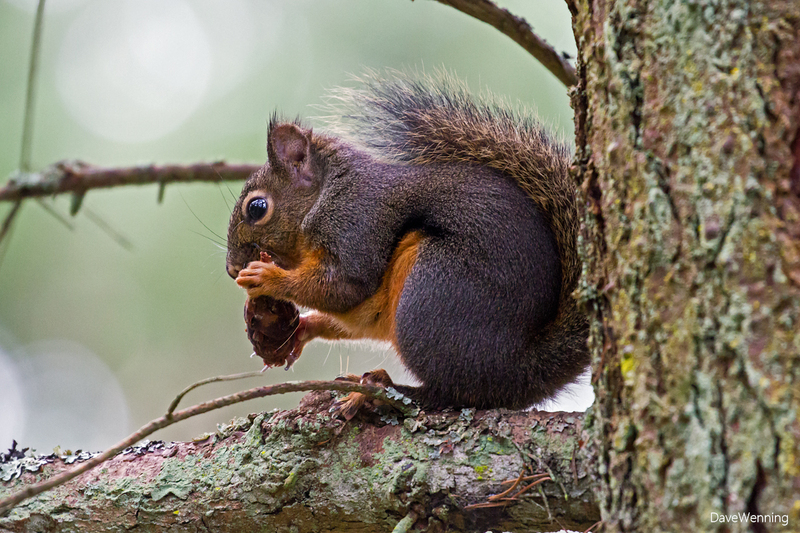 This one was more interested in munching on that fir cone. 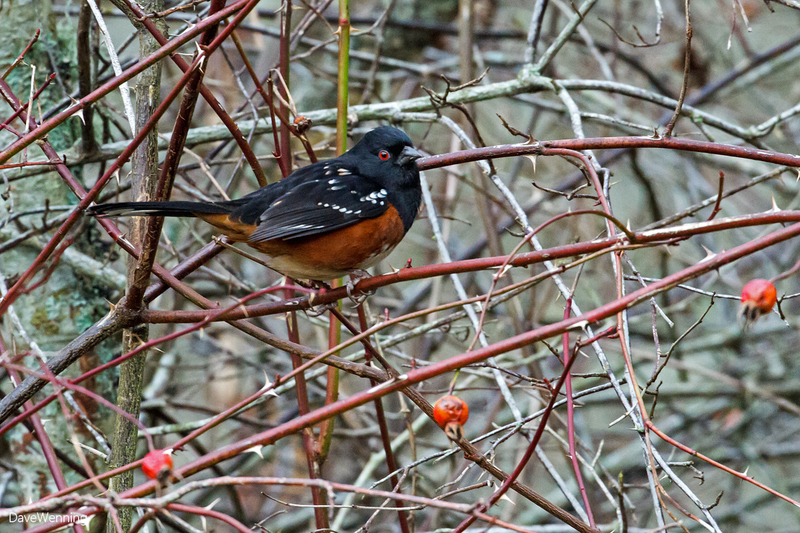 The Spotted Towhee is one of my favorite birds. Singing their tow-HEE notes as they forage, this largest of sparrows is always charming. They are usually patrolling thickets where it can be difficult to get a clear shot. This one was right at the edge of the large clearing where the Dunlap home stood. This is a male, and he was a moving target. I was only able to get two shots before he was gone. The lens did well under the circumstances. I headed to the beach hoping to spot the Black Oystercatchers that make their home on Flagstaff Island. There were none on the beach, but a small group flew by low over the water. 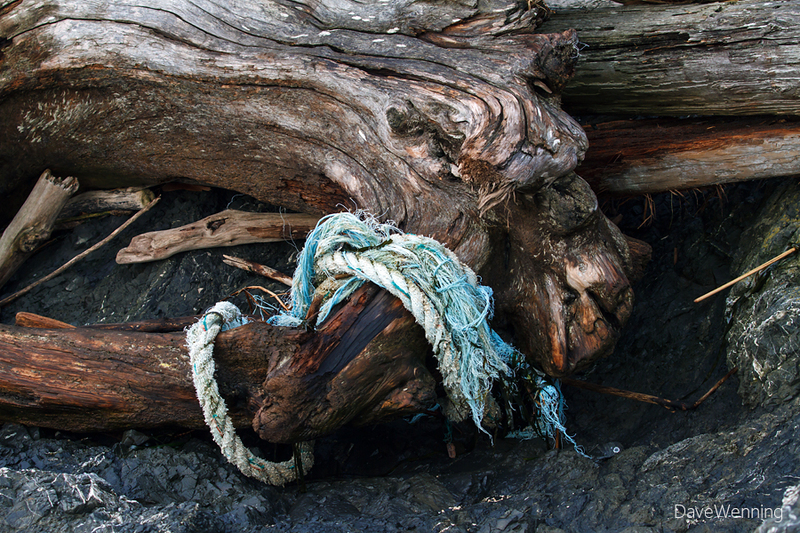 Instead, I spotted this bit of flotsam tangled in the driftwood. 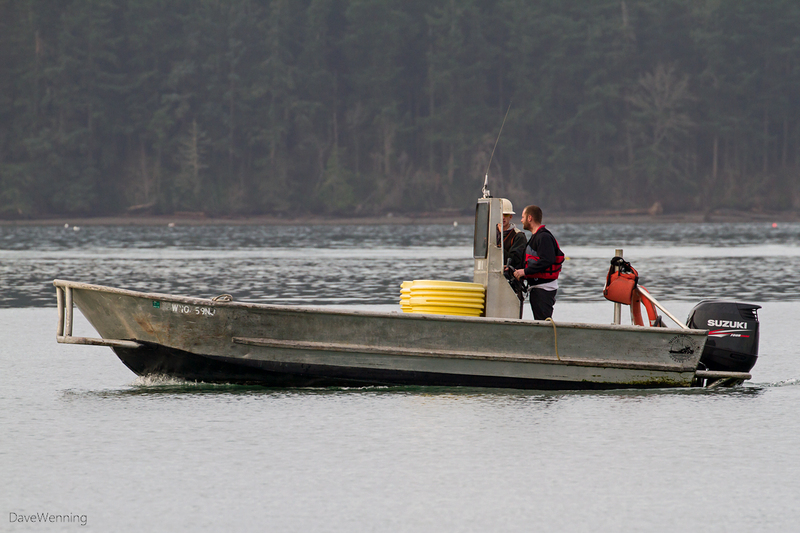 Next, these crab fishermen motored by a couple hundred meters off the beach. If they noticed me photographing them, they didn't seem to mind. That's Hope Island in the background. The lens has two distance range settings for auto-focusing, Full and 3m to infinity which I tried. After a couple of shots, I started getting an Error Code 01 on the 7D. That's a lens to camera communication error. When I switched it back to Full, everything was fine again. I have cleaned the contacts and will recheck it the next time out. UPDATE: The 3m - ∞ range setting is now working. Switching the camera off before changing the setting may also be helpful. UPDATE 2: I took the lens out a second time on 12/26/2014. After about 50 successful shots, I started getting Error 01's again. The lens failed in every range, focus and stabilizer setting. Cleaning the contacts with solvent did not fix it. I tried the eraser end of a Lens Pen and that got it working again. It remains to be seen if this fix will be permanent. Left: Does anyone know what this is? I recall the standpipe along the South Trail, but it just had a flat, round cap on top. 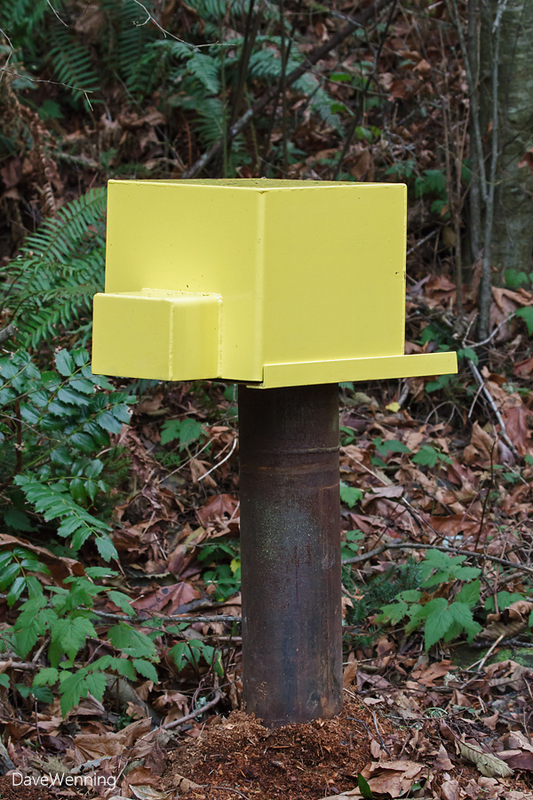 The yellow structure is new. It looks important with its shiny paint. 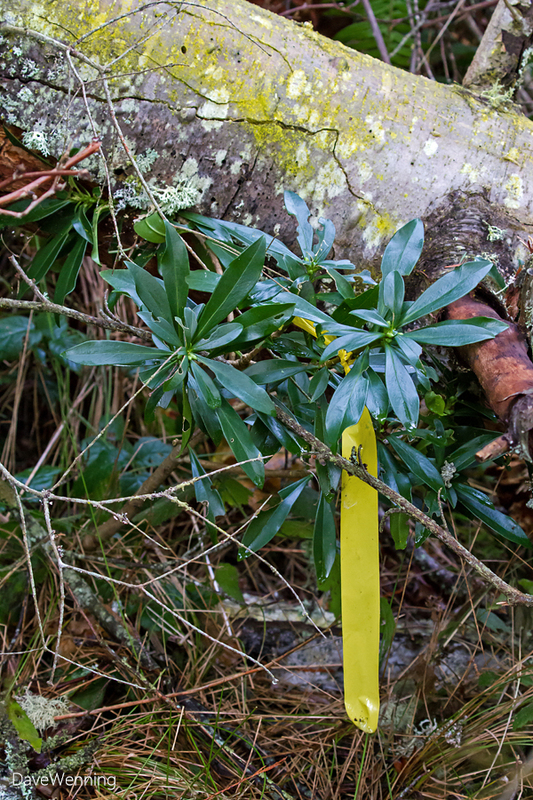 Right: Spurge Laurel has been marked for eradication. This is an invasive, noxious understory weed in western Washington that can spread quickly and choke out native plants. The berries and plant juices are poisonous to humans and pets. While not a macro lens, the 100-400 can step up if called upon. You just have to stand back a couple yards. 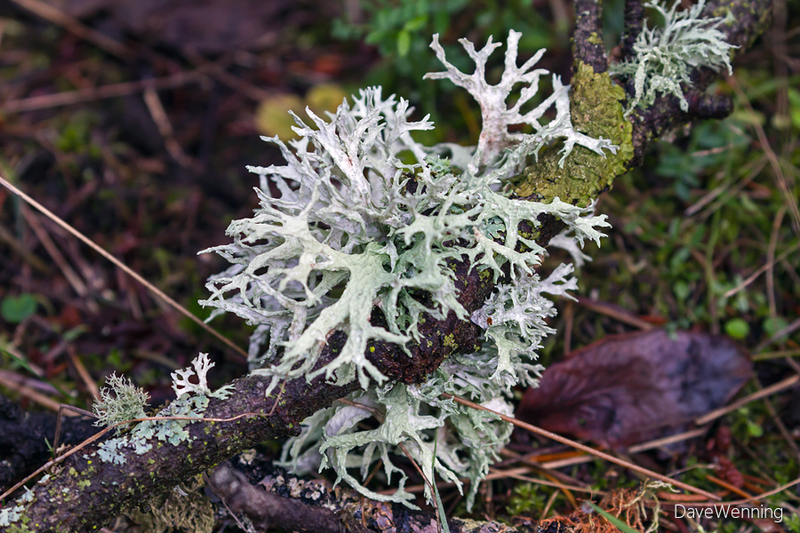 I believe this is Forking Bone Lichen which grows on the branches of conifers. It is found on the ground when a branch breaks off in the wind. 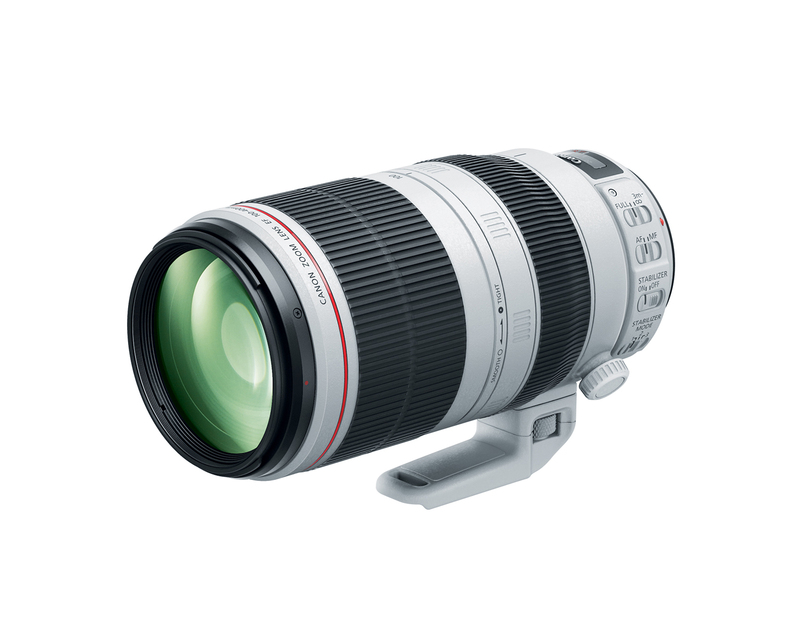 The 70-300 has a macro designation, but the 100-400 does not. 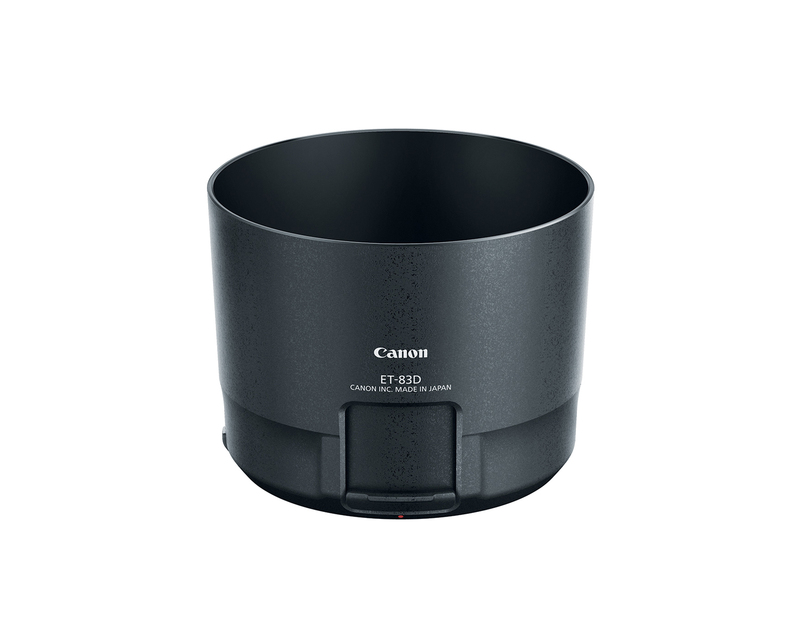 The lens comes with a hood that has a little window for adjusting a circular polarizer. When I got back to the parking lot to head home, I could not get the hood off the lens. I was able to replace the cap with the hood still mounted. After I got home, I discovered a little release button that unlocks the hood from the lens allowing me to flip it around for storage. Of course, that's right there in the instructions. Finally, here is my beachcombing haul, some weathered Dogwinkle shells and a piece of sea glass. 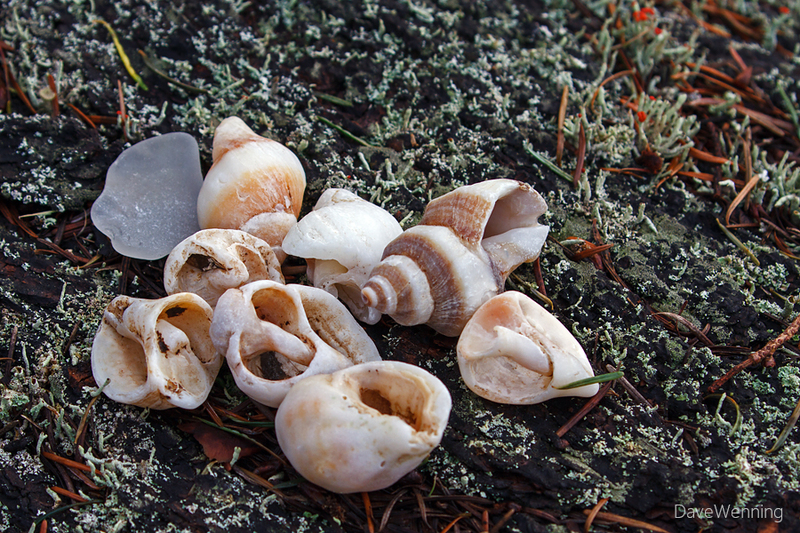 I collect a few of these broken snail shells every time I'm at the beach. Don't ask me why. I had a good time trying out the new lens. Except for the lens and hood photos from Canon USA, all were taken with the new 100-400. It's fairly large and heavy compared to what I am used to, but the image stabilizer works well. It focuses very quickly, and I think I am getting better colors with this lens. I am very pleased after my first outing. I just have to see if that error code problem recurs.